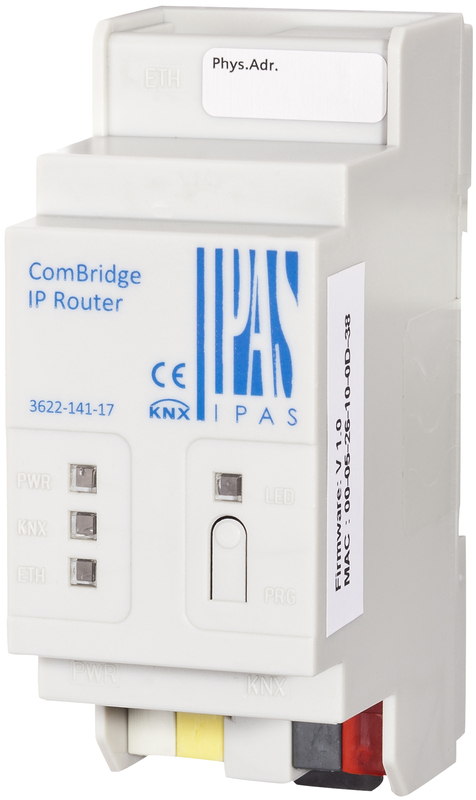 CB IP-R connects bus lines or bus areas with the Internet Protocol (IP) via a fast data network. It uses the standardised KNX protocol KNXnet/IP. The device can be used as line, area or network coupler and enables the communication between KNX devices and PCs. It is also equipped with a web server. Pluggable terminal blocks to connect to the external voltage source AC/DC 24 V, bus connection via bus terminal, Ethernet connection via RJ45 plug, 2HP modular device. KNX installations can be accessed remotely in connection with a LAN-modem or DSL Router. CB-IPR supports 5 tunnel connections which can be used, for example, as ETS programming connections. Network parameters such as multicast address, IP address, subnet mask and standard gateway are programmed with the ETS. Additional parameters define the rules for KNX group address filtering. CB-IPR also offers an object server connection which can be used for visualisation systems such as ComBridge Studio Evolution. Both connection types – tunnel and object server connection – can be used in parallel. If you load the URL of the router in a standard browser, the CB-IPR web pages display information about the bus load and the number of bus telegrams that have been transmitted from KNX to IP and vice versa.. Connected and not connected tunnels and object server connections as well as the corresponding connection details are also displayed. Password-protected websites offer the possibility to cancel the connection. An unauthorised connection to the KNX system can thus be prevented.